Oregano bunched and ready to hang to dry. My family loves Italian style food so we go through a ton of the herb oregano each year. Luckily it’s very easy to grow; you can start it from seed or buy a plant at most local nurseries. It does best in full sun and doesn’t like to be water logged but do be aware that it self seeds quite easily. 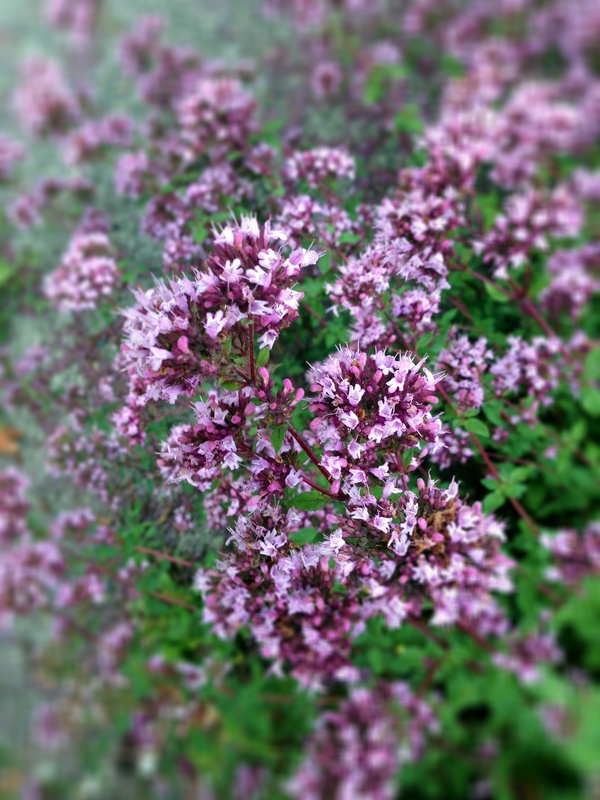 Right now is a good time to harvest oregano! This flavorful Mediterranean herb is best harvested on a warm, dry morning right before it blooms. To harvest and dry cut it three inches above the ground then bunch it and hang it in a cool place with good air circulation. Be careful not to make the bunches too big or the stems in the middle might rot. Once dry I store it in the basement in mason jars and bring up just enough to last a week or so as the heat and light in the kitchen can make it lose flavor quickly. In addition to adding oregano to the usual pizza and spaghetti sauces here are some other interesting ways to use this prolific herb. Bring water to a boil. Add the sugar and stir until sugar has dissolved. Add the oregano to the syrup. Boil for 60 seconds and let it steep for 30 mins as the syrup cools. Pour the cooled syrup through a strainer into a glass bottle jar. Store syrup in the refrigerator. Small amounts can be added to sparkling water or it can be used in cocktails. I think it pairs well with vodka. The flowers taste good and can be dried for great bouquets. Heat oil in a frying pan, add chopped garlic and chicken. Cook until the outside of the chicken begins to brown. Add the lemon juice, zest and olives and turn down the heat. Cook slowly until the chicken is almost done. Add the chopped oregano and finish cooking. Add salt and pepper to taste. Serve garnished with a fresh sprig of oregano. Finely chop 1/4 to 1/2 cup fresh oregano mix with one cube softened butter. Roll into a log on wax paper then wrap in the paper, put in a plastic freezer bag and freeze until needed. Can also be immediately but should be refrigerated if you need to store it. This butter can be used to baste meat, season veggies or on bread. Chop fresh oregano and mix it with olive oil. Pour it into ice cube trays and freeze it. Once frozen put in freezer bags. This can be used in salad dressings, to baste meats or veggies or anytime fresh tasting oregano is needed. Take a block of feta and cover it with 4 cloves crushed garlic and 4 T fresh oregano leaves. Drizzle with 1/4 c olive oil and top with a large tomato. Bake at 350 for 20 minutes until bubbly. Serve with bread or crackers. 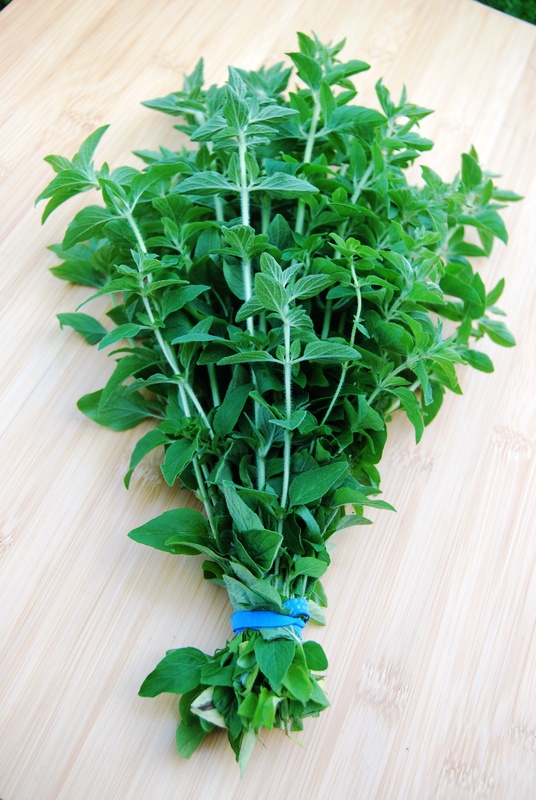 Chop fresh oregano and mix it with olive oil and other fresh herbs to taste. Cover meat to be grilled with this mixture then cook over a hot fire. This will both add a nice flavor to the meat and keep it moist. Do you have other favorite ways to use oregano? I’d love to hear them!